How the 100th anniversary of the Easter Rising was commemorated throughout the U.S.
Of the seven signatories of the 1916 Proclamation, five traveled to New York to seek assistance from the long-established republican Irish American community there, including Tom Clarke, who became an American citizen in Brooklyn in 1883, and John Connolly. Key figures in New York like Jeremiah O’Donovan Rossa and John Devoy, Irish American organizations like Clan na Gael, and numerous Irish American newspapers in the city, including the Gaelic American, owned by Devoy and edited for a time by Clarke, remained fiercely determined to a free Ireland, sending money and arms in advance of the Rising and making the city a home away from home for Irish rebels. New York City paid homage to that history throughout 2016, hosting a total of 70 events to commemorate the Rising. 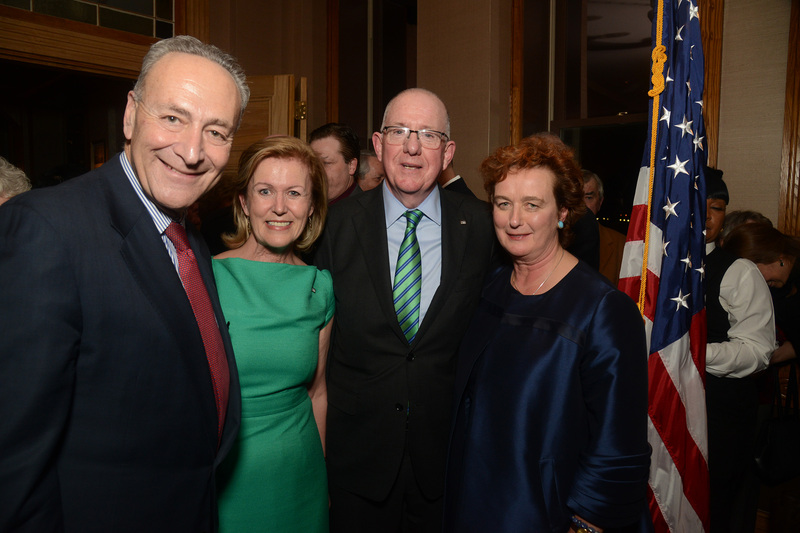 The centenary year was officially launched in New York in January by Minister for Foreign Affairs of Ireland Charlie Flanagan and Irish Ambassador Anne Anderson, and included such notables as New York Senator Chuck Schumer, author Colum McCann, Irish Tenor singer Anthony Kearns, chair of Culture Ireland Mary McCarthy, singer Maxine Linehan, and actor Liam Neeson at a community gathering at Pier A Harbor House in lower Manhattan, where an original copy of the 1916 Proclamation was displayed. In February, Lehman College’s Institute for Irish American Studies, CUNY held a symposium on Irish language literature and the history of Ireland, which combined bilingual readings, guest speakers, writing workshops, and social gatherings. Downtown, author Colum McCann hosted a night of poems by Irish and Irish American poets read by blockbuster Irish writers like Alice McDermott, Anne Enright, and Paul Muldoon, who debuted a new poem commissioned by NYU for the occasion. 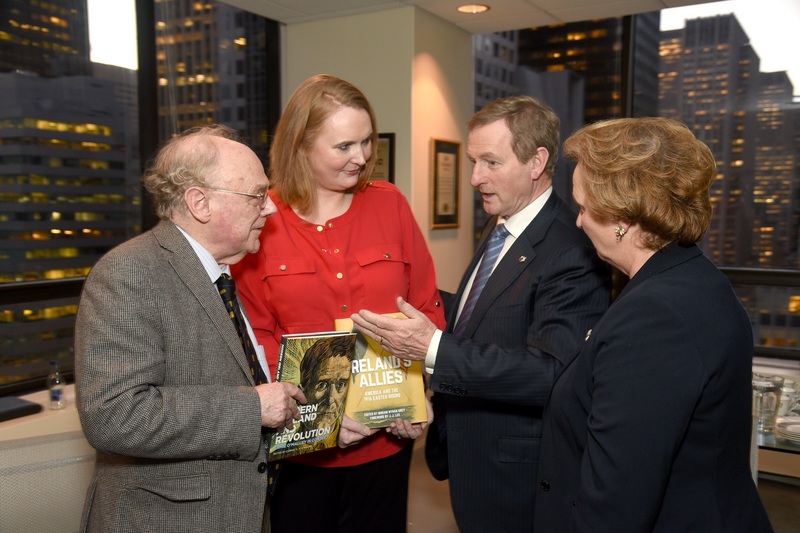 Historians J.J. Lee and Miriam Nyhan Grey with Enda Kenny and Barbara Jones with Nyhan Grey’s new book Ireland’s Allies: America and the 1916 Easter Rising. 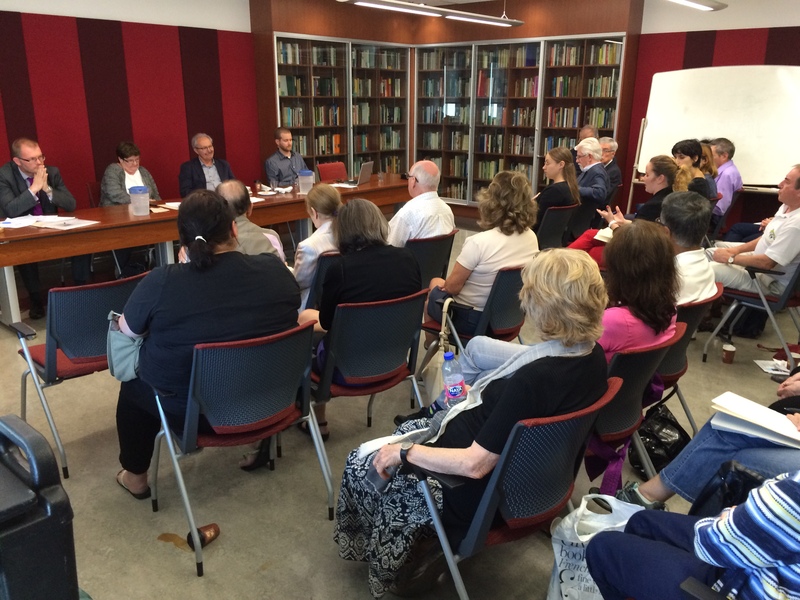 In April, NYU also hosted a major international conference, “Independent Spirit: America & the 1916 Easter Rising,” focusing on the trans-Atlantic context of the Rising with speakers like noted academics J.J. Lee, Terry Golway, Lucy McDiarmid, Miriam Nyhan, and Robert Schmuhl. Uptown, a commemorative centenary concert curated by Grammy-award winning composer Bill Whelan and Pulitzer Prize-winning poet Paul Muldoon featuring Liam Neeson, Colm Tóibín, Zadie Smith, Panti Bliss, Cassandra Wilson, and more, with an orchestral backing, was held at the Peter Jay Sharp Theatre. The centerpiece of the year was the official Irish government centenary commemoration on April 24, the day the Rising began, at Battery Park. The event included a reading of the proclamation, the laying of a wreath, a minute’s silence, the raising of the Irish flag, and performances of the U.S. and Irish national anthems and a day-long celebration of Irish heritage with music, song and dance. The New York Public Library also played host to a commemorative event, “Poetry 100,” where poets, singers, and authors including Sinead Morrissey, Nick Laird, Iarla O Lionáird, Alvy Carragher, Ciaran Berry, and Fanny Howe explored one hundred years of Irish poetry since the Rising. 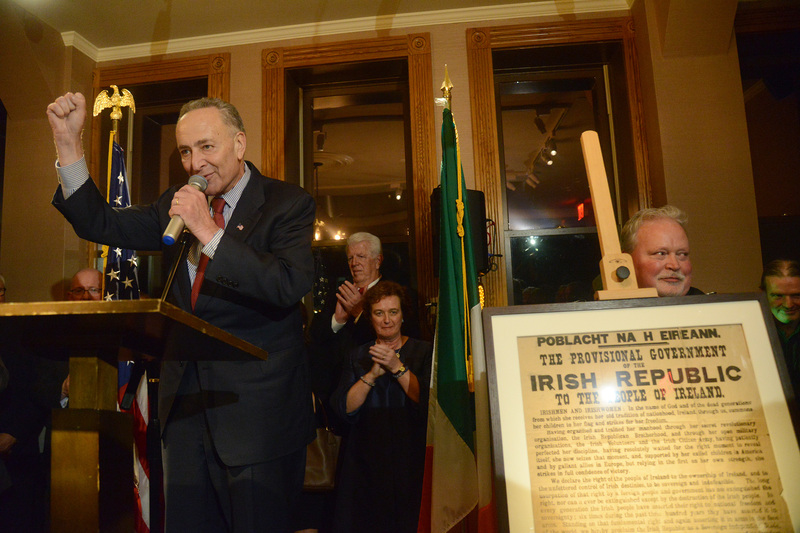 On Staten Island too, this year’s Staten Island Irish Fair was dedicated to the lives lost in the 1916 Rising. Each year, the fair features traditional bagpipe bands, local Irish dance schools, special entertainment for young children, and local food and craft vendors. Chris Cahill, executive director of the American Irish Historical Society, with AIHS librarian Georgette Keane at the “Her Exiled Children: 1916 Archives” exhibition last year. From April to August, the American Irish Historical Society hosted a landmark exhibition called “Her Exiled Children: 1916 Archive Exhibition,” which used it own archives to contextualize the American dimension of the Rising and tell the story from planning to aftermath of Easter Week 1916. 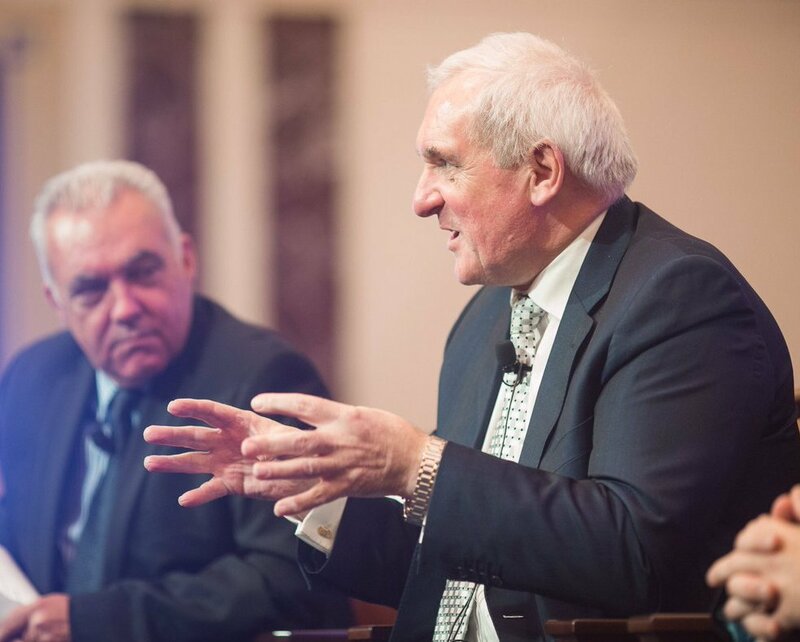 September 27: Kevin Cullen and former taoiseach Bertie Ahern speak in Boston. In 2016, Massachusetts rose up to commemorate the 1916 Easter Rising centennial, similar to how the state’s Irish community responded when Ireland’s most transformative episode unfolded a century ago. As in 1916, these commemorative activities took place in Boston, but also in the mill cities of Lawrence, Chicopee, Springfield and New Bedford, where Irish American communities were robust a century ago and remain relevant today. In February, Boston College hosted a standing-room-only forum at Gasson Hall with U.S. Congressman Richard Neal and Boston mayor Marty Walsh. Walsh recounted the influence the Easter Rising had on his immigrant parents from Connemara, who came to Boston in the 1950s. He mentioned union leader James Connolly, who temporarily lived in Boston’s Mission Hill neighborhood, and Patrick Pearse, an Irish speaker who spent time in Rosmuc the village of Walsh’s mother, writing poetry and studying Irish. 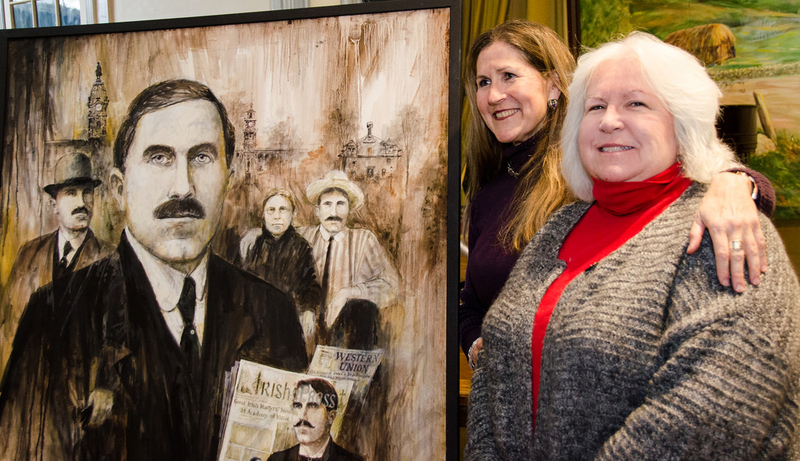 Congressman Neal also made local connections to Springfield, mentioning that Pearse had come to Springfield to raise money because of the strong presence of Clan na Gael in that city. The Ancient Order of Hibernians played a central role in 1916 when they advocated for Ireland and raised funds for relief of the Dublin families affected in the aftermath of the Rising. In Lawrence, Division 8 presented A Pictorial Exhibit of the 1916 Easter Rising, at Lawrence Heritage State Park, while Division 1 in Chicopee presented an exhibit, Of Terrible and Splendid Things, at Elms College. In April, the Irish Cultural Centre in Canton featured music and dance from Boston’s Comhaltas Ceoltoiri Eireann, and the Irish Proclamation was read. Also in April, Senator Michael Rush invited Ireland’s Consul General Quinlan to the Massachusetts State House to reflect upon the Easter Rising. Her talk was followed by a reading of the Proclamation by Senate President Stan Rosenberg and other state senators. In May, Congressman Neal, Consul General Quinlan and local officials unveiled a Garden of Remembrance in Springfield to commemorate the Rising. Irish tenor Ronan Tynan sang the national anthems. 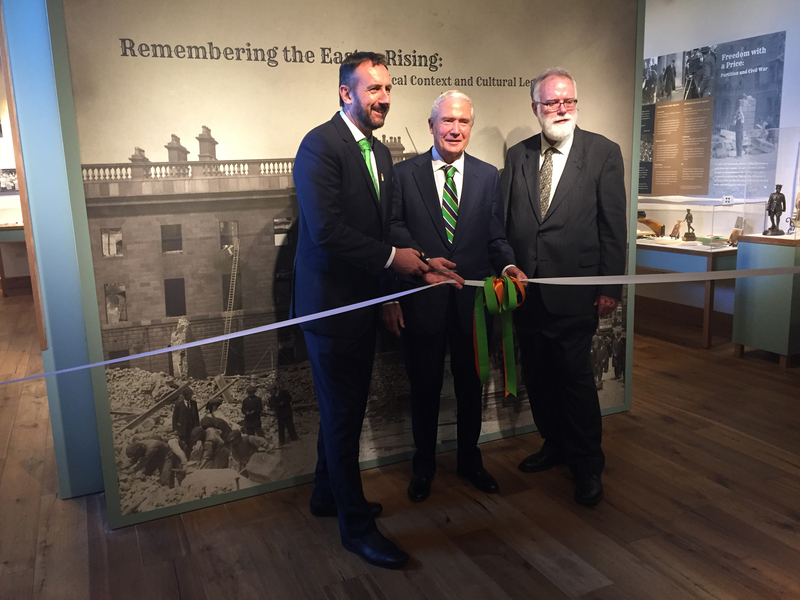 In September the Edward M. Kennedy Institute in Boston hosted a forum, “Ireland: Then & Now,” featuring former Irish Prime Minister Bertie Ahearn, along with Rev. Dr. Gary Mason, former MA Senate President Therese Murray, Boston College Professor Rob Savage, and Boston Globe columnist Kevin Cullen. Finally, in October, the New Bedford Whaling Museum launched a speaking series entitled “Famine, Friends & Fenians,” exploring the New Bedford-Irish connection from the 18th century through the Easter Rising in 1916. It featured Professor Catherine Shannon and author Peter Stevens. Young adults who represented the various people who were instrumental in the Easter Rising of 1916 in Dublin. As the center for Irish immigration in the Midwest, Chicago has deep ties to Irish republicanism. For the past century and a half, the Irish have exerted their influence in the city through labor, government, and stockyard jobs. Prior to the Rising, John Devoy wrote for Chicago newspapers and held correspondences with key Irish figures in Chicago like Alexander Sullivan, a Canadian-born Irish nationalist and Chicago machine boss who was a fierce supporter of the dynamite terror campaigns in England. No surprise then that Chicago’s centenary celebrations were among the largest and most numerous in the country. The Consulate General of Ireland’s flagship event of the yearlong commemoration took place in June at the Chicago Cultural Center, in partnership with the Irish Fellowship, and the Irish Georgian Society, to host a cultural reception. Earlier in the year, the Consulate collaborated with the University of Notre Dame for the gala premiere of the university’s landmark documentary, 1916 The Irish Rebellion, at the university in South Bend, Indiana. The documentary narrated by Liam Neeson, shares the untold story of Irish Americans’ role in the Rebellion and unseen footage filmed worldwide. The official launch of the companion book, published by the University of Notre Dame Press, was hosted at the Press Union League Club in Chicago following the premiere. To finish off the centennial year, the Consulate held an academic program making the Rising relevant to the Irish political landscape of today. The Southside Gaelic Park also celebrated 1916 with cultural movies, traditional festivals, music, and a “Living History” exhibit featuring school children dressed as Rising leaders and giving brief biographical performances. Chicago continued the celebration with Cork City native, Paddy Homan, who commemorated 1916 with his own theatrical performance, “I Am Ireland” at Gaelic Park in March. 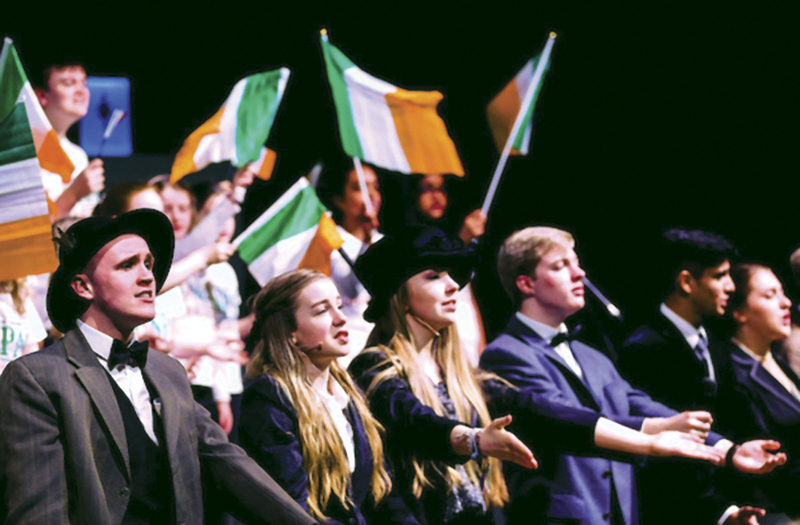 The show illuminated the struggles and sacrifices of the Irish independence movement through stories, poetry, and song. “These stories and songs resonate with so many people, because it is a part of their history,” Homan said. He brought the show to Cork city last year, and this fall, he plans to bring the show on a national U.S. tour. The Irish American Heritage Center in Chicago on front steps reading the Proclamation at exactly 12:04 pm on April 24, 2016. The Irish American Heritage Center also marked the 100th anniversary of the Rising by hosting a Day of Remembrance, capped off with an evening musical tribute, “Songs of Freedom,” featuring the Chancey Brothers, the Dooley Brothers, and Catherine O’Connell, among others. And in October, the annual Irish Books, Arts, and Music Celebration brought the literary connections to the Rising to the fore with a weekend-long festival featuring music concerts, lectures, poetry readings and contests, panel discussions, theatre performances, and exhibitions on loan from Ireland. 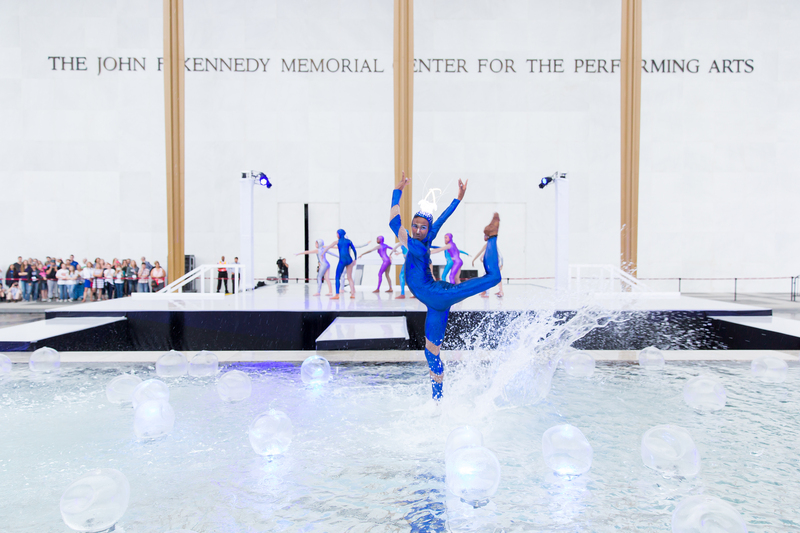 Dancers celebrate JFK’s 100th year at Ireland 100. Robert Emmet Statue: In April, the Washington, D.C. statue of Robert Emmet, the first of its kind and the model for several identical copies by Irish sculptor Jerome Connor, was rededicated in a small park on Massachusetts Avenue, near the Irish Embassy and Irish Ambassador’s residence. Pictured (L-R): Captain Peter Kelleher, Ambassador Anne Anderson, NY State Representative Joseph Crowley, Robert Vogel of the National Parks Service, Smithsonian director Elizabeth Broun, Irish American Unity Conference president Thomas J. Burke, and national AOH president Brendan Moore. 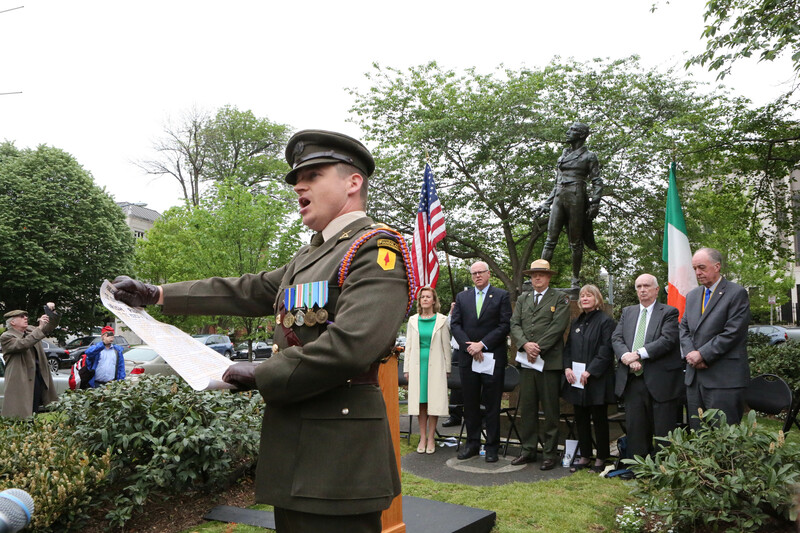 The ceremony marked the concurrent centenaries of the Easter Rising, the formation of the National Park Service, and the creation of the first commemorative statue of Robert Emmet, which was cast in 1916. Kennedy Center – Ireland 100: The national centerpiece of the Easter Rising centenary celebrations in the United States was “Ireland 100: Celebrating a Century of Irish Arts and Culture,” a three-week festival held at the John F. Kennedy Center for Performing Arts in Washington, D.C. in conjunction with the Irish Embassy in May and June. 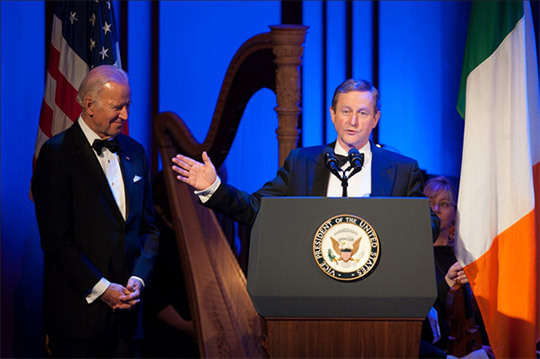 Joe Biden and Enda Kenny open Ireland 100. The festival featured dozens of musical, theatrical, literary, culinary and dance acts and installations that spanned the breadth of Irish arts over the past century from a modern staging of Sean O’Casey’s The Plough and the Stars, to a score of Tiny Plays for Ireland and America, to the ethereal sounds of the world’s largest string instrument, the Earth Harp. Actress Fiona Shaw served as the official artist-in-residency for the festival. The last week of the festival was largely dedicated to Ireland’s extremely strong literary tradition and featured fascinating panel discussions with Colm Tóibín, Eavan Boland, Nuala Ní Dhomhnaill, Louis de Paor, Colum McCann, Paula Meehan, Siobhán Parkinson, capped off with “Muldoon’s Picnic,” a musical and literary revue hosted by New Yorker poetry editor Paul Muldoon. Grace Cathedral in San Francisco during the Ireland’s Poet Patriots concert. 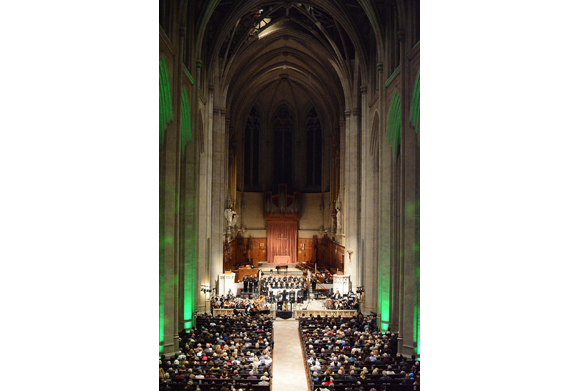 The centerpiece of 1916 centenary events on the west coast was a unique and original concert held at San Francisco’s Grace Cathedral, in the city’s historic Nob Hill neighborhood. 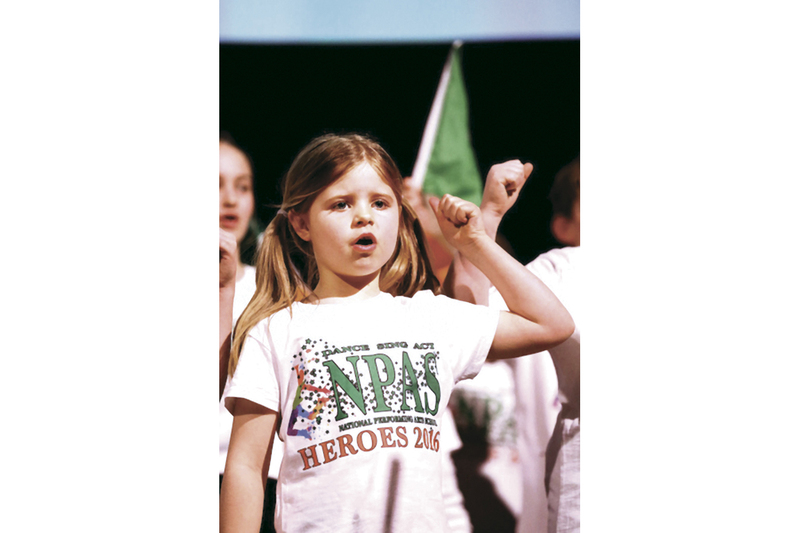 The concert, “Ireland’s Poet Patriots: A Musical Tribute,” was composed by American Richard Evans and endeavored to bring to life the works of 12 of Ireland’s great writers, including Robert Emmet, W.B. Yeats, Ella Young, Peadar Kearney, Maud Gonne, and Pádraig Pearse. 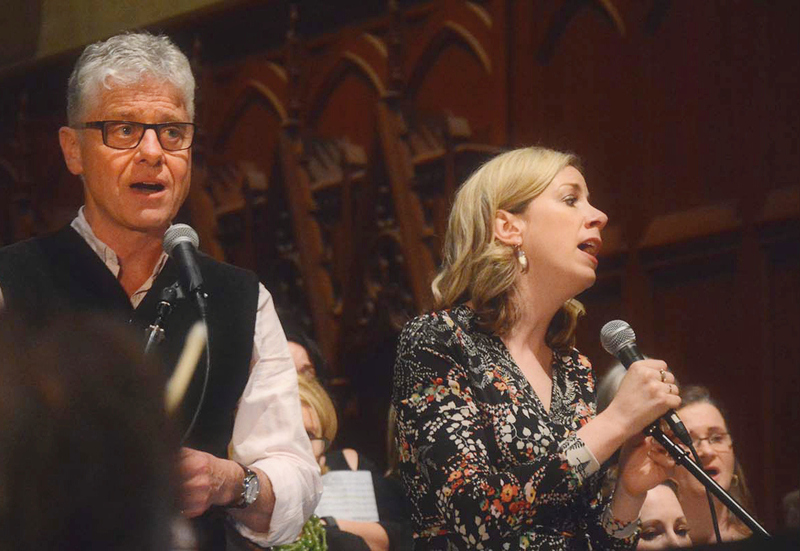 The performance combined original compositions and traditional Irish music, including two sean-nós musicians from Ireland, as well as featuring three classical vocalists, 25 mixed voices, a 28-piece concert orchestra with harp, and a traditional Irish ensemble. Irish soloists Christy O’Leary and Muireann Nic Amhlaoibh. The 13th annual Irish American Crossroads Festival also took over San Francisco in April, this year presenting 14 cultural events and four directly tied to the Easter Rising, including an Irish American historical walking tour of the Mission District, a former working class Irish enclave, co-sponsored with the organization Shaping San Francisco. Elsewhere on the west coast, the Irish American Bar Association in Los Angeles held a commemoration in Long Beach with Regional Bishop David G. O’Connell of the Archdiocese of Los Angeles and M. Finbar Hill, Honorary Consul General of Ireland. The Irish Cultural Center and McClelland Library in Phoenix, AZ also hosted a number of commemorative events, including a lecture series, a multi-media musical presentation, literary discussions, and an exhibition called “Remembering the Easter Rising,” which has been extended to run through June 2017. The University of California in Berkeley also held a conference within their Celtic studies department to mark the centenary of the Rising. 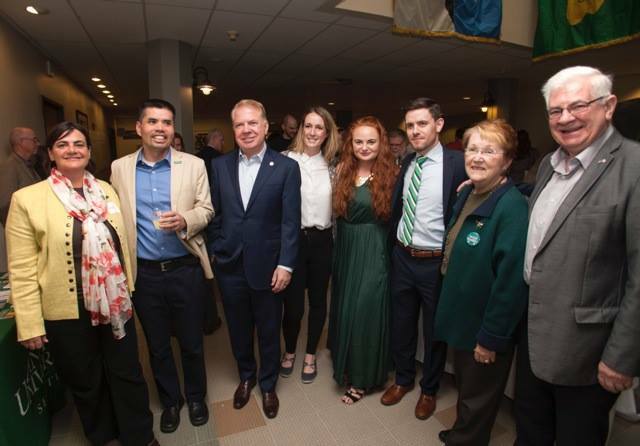 Seattle Mayor Ed Murray, third from left, attends Antioch University’s Easter Rising commemoration in Seattle with members of the city’s Irish community. In the Pacific Northwest, Seattle’s Antioch University hosted a weekend event with academic lectures, art installation, traditional Irish music, dance and culture with mayor Ed Murray. And in Portland, OR, the local chapter of the Ancient Order of Hibernian held a special event that explored the city’s unique connection to the rebellion and featured readings from actors and actresses from Portland’s acclaimed Corrib Irish Theatre. 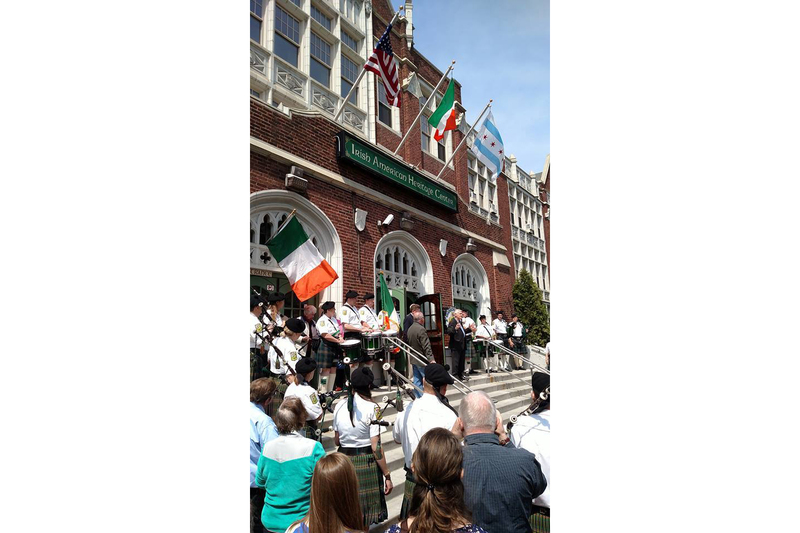 In Denver, the AOH/LAOH organized a celebration inviting members of the Irish community. Irish-Americans, Irish ex-pats, and friends of Ireland were represented by the Colorado Emerald Society, Irish Network Colorado, Michael Collins Pipes and Drums, Celtic Friends, Dr. James Walsh, Dennis Gallagher, and Séamus Blaney. 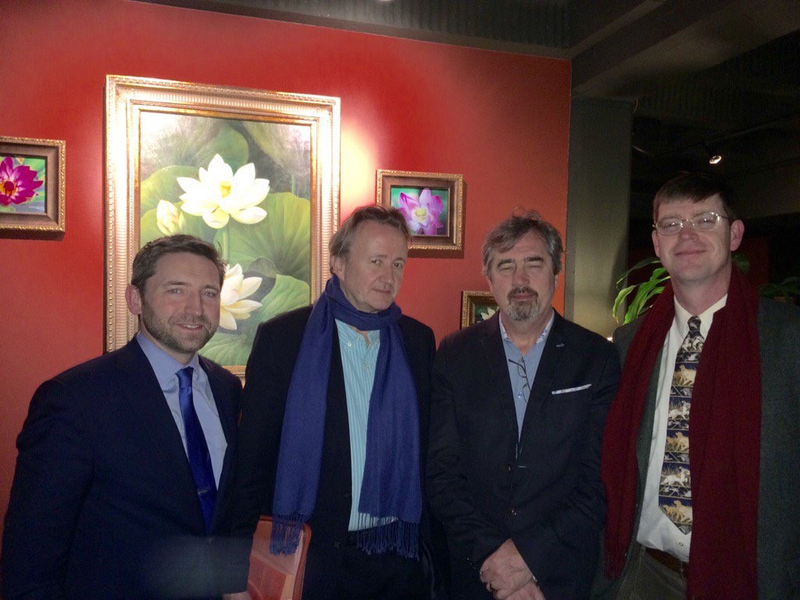 Pictured are local AOH president Jeff Rodenberg and Ken Hannon Larson, editor of Teach Tá­­­bhairne Fógra. 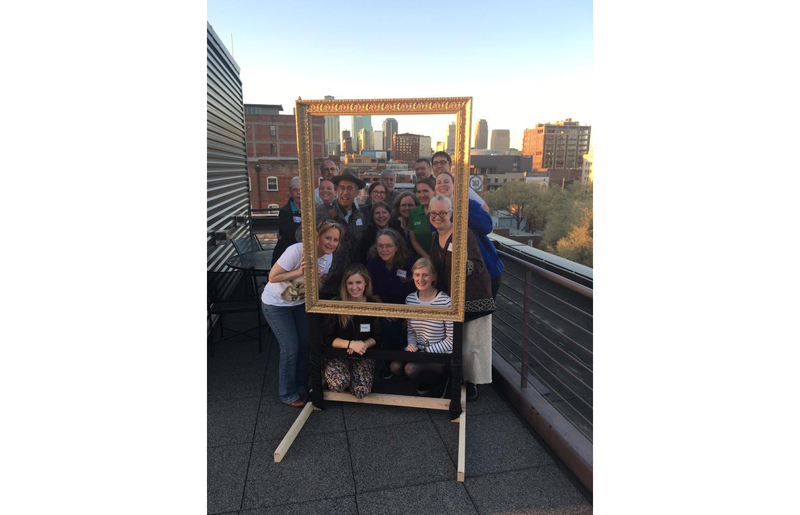 The Kansas City Irish Center hosted their annual Fulbright Language Immersion Weekend from April 8 through April 10 with particular focus on remembering the Rising. The center held Irish language classes for beginners and intermediate speakers. Consul General Adrian Farrell, center, commemorated the 1916 Easter Rising with the Ancient Order of Hibernians in Austin at St. Mary’s Cathedral. 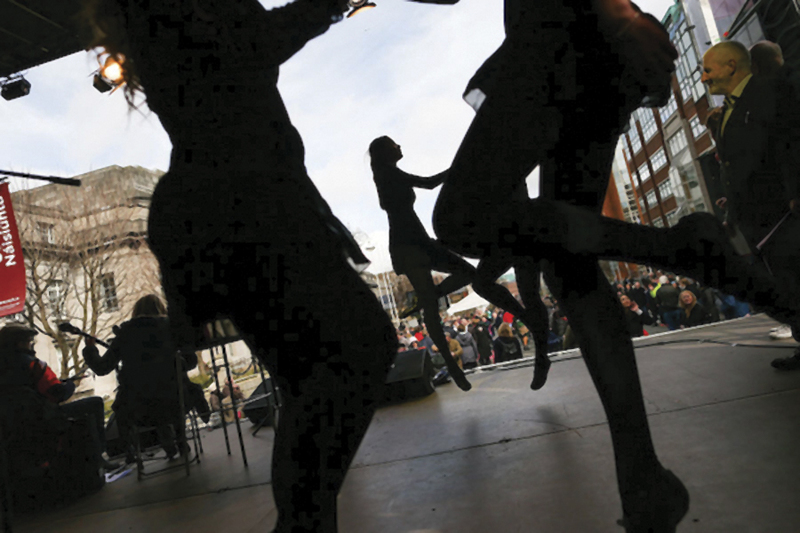 It was an event of song, story, and dance with special appearances from Austin’s Inishfree Irish Dancers and Irish Consul General Adrian Farrell. Presented in conjunction with the Celtic Cultural Center of Texas and the Consulate of Ireland in Austin. 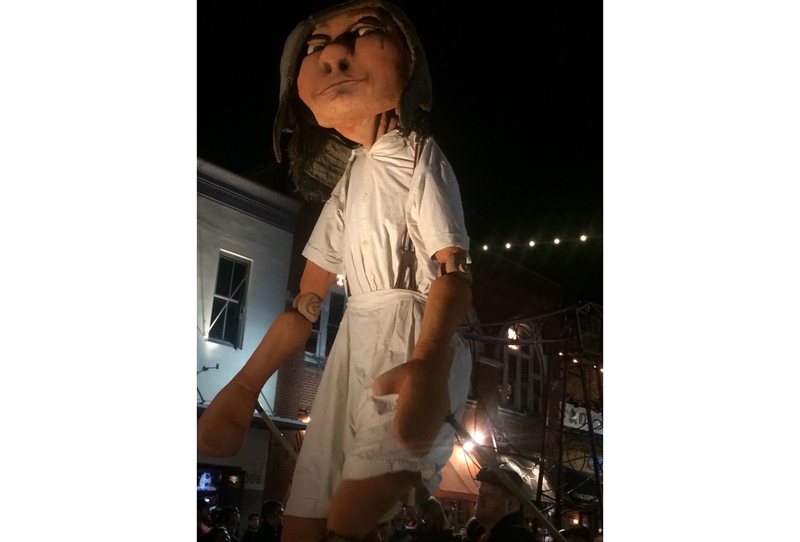 On March 12, Macnas, an internationally acclaimed Irish performance and spectacle company based in the West of Ireland, presents a high-octane, visually stunning series performances during the SXSW festival in Austin, Texas. Part of Culture Ireland’s “I Am Ireland” program. At Baylor University, Professor Roy Foster (center left), W.B. 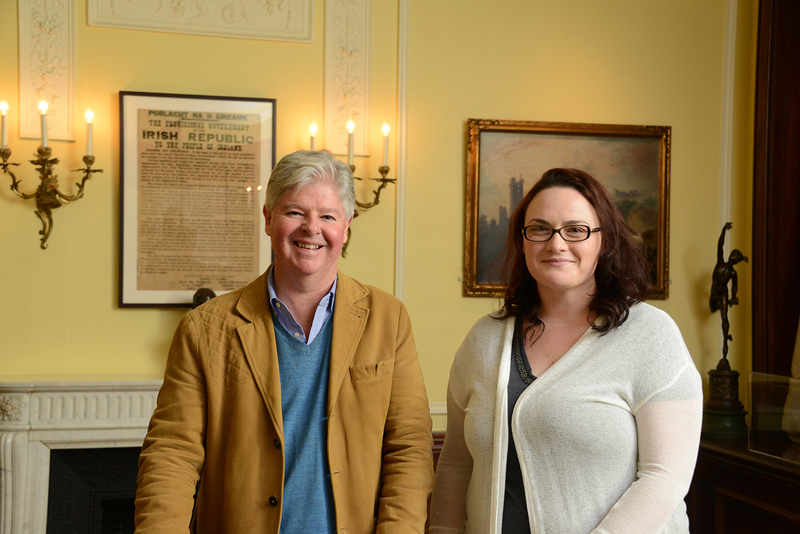 Yeats’ official biographer, Oxford lecturer and Irish historian, spoke with award-winning Irish novelist, poet and playwright Sebastian Barry (center right). March 3, 2016: Actor Liam Neeson arrives on the red carpet for the Gala Premiere of the documentary 1916: The Irish Rebellion at the Leighton Concert Hall in the De-Bartolo Performing Arts Center at the University of Notre Dame in South Bend, IN. Producer Bríona Nic Dhiarmada speaks at the Gala Premiere of the Notre Dame Documentary. Rev. 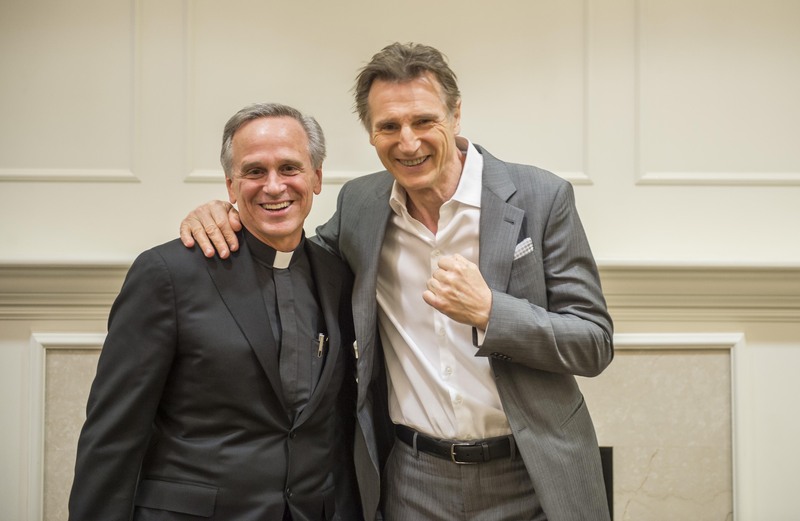 John I. Jenkins with Liam Neeson at the Notre Dame Gala Premiere of 1916: The Irish Rebellion March 3, 2016. More than 1,000 people turned out in front of Philadelphia’s Independence Hall in April to commemorate the centenary of the Easter Rising in a city where a full fifth of the population claims Irish ancestry. 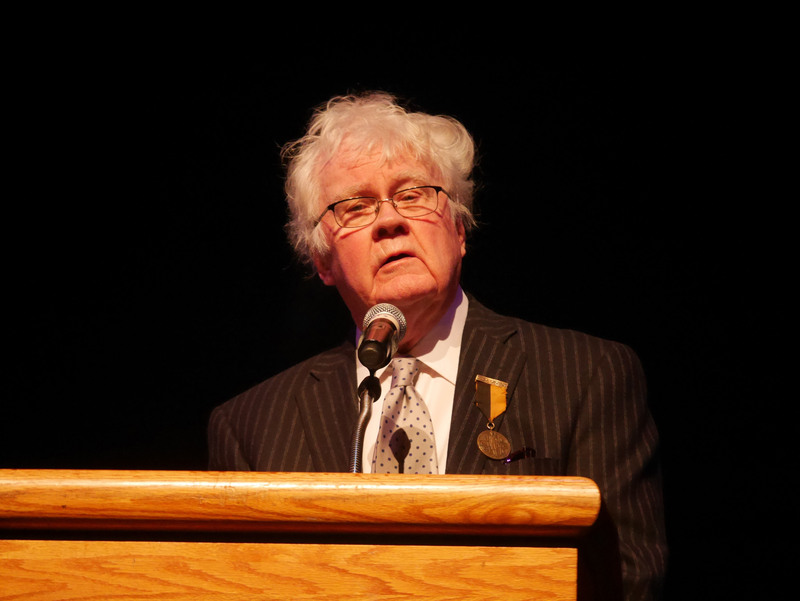 The ceremony included pipe and drum bands, a flag raising, a keynote speech by Tyrone native Patsy Kelly (pictured above), who pointed out that many Irish rebels might have descendants in the audience. He was right; among those also in attendance was Kevin Kent, chair of the Irish American Business Chamber in Philadelphia and a distant relative of Eamonn Ceannt, one of the signatories of the Proclamation. 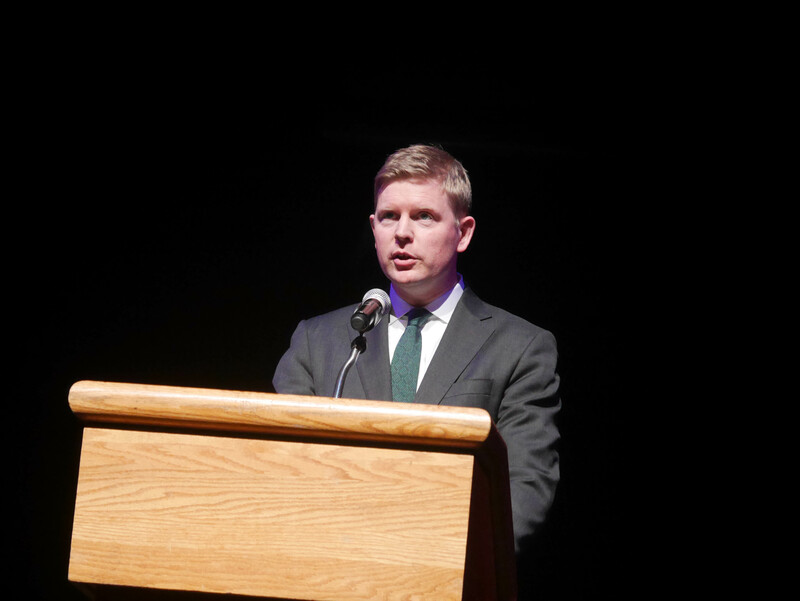 The success and size of the centenary celebrations in the city showed that it “has always had a strong Irish American community,” Kent told Philly.com. McGarrity’s archives are held at Villanova University, where the ground floor of the Falvey Library there was given over to a months-long exhibit, “To Strike for Freedom: The 1916 Easter Rising,” that included McGarrity’s personal papers and an original copy of the Proclamation. – A.F. 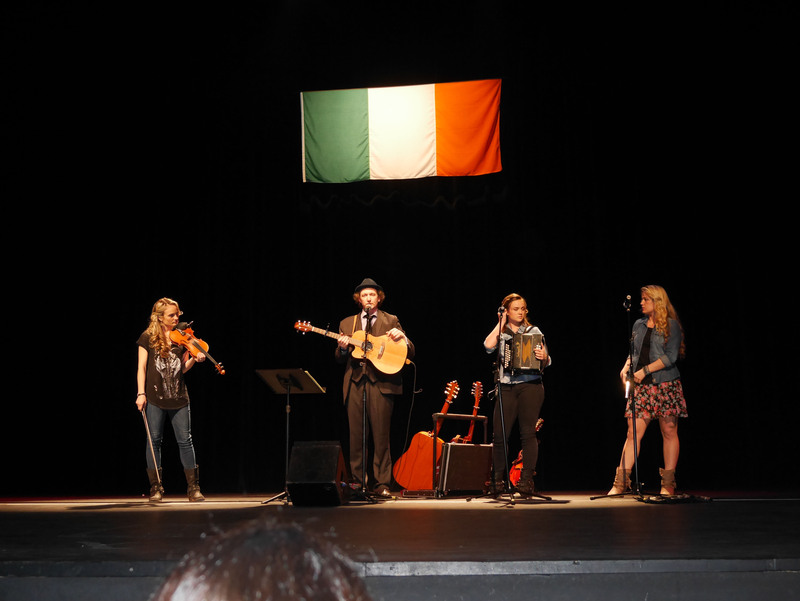 March 6, 2016: 1916 Centenary Concert – A Celebration of Irish Culture. Hosted by the Consulate in Atlanta and headlined by The Willis Clan from Nashville and Irish musician John Doyle, this concert program at Georgia Tech’s Ferst Center for the Arts on 6 March also included poetry from Yeats, Pearse and Tom Kettle arranged by Professor James Flannery and an excerpt from We Have Risen, an original 1916 performance commissioned by Consulate. The Willis Clan and John Doyle perform at the Atlanta Centenary Concert. Professor James Flannery, wearing his father’s War of Independence medal, reading Easter 1916 by W. B. Yeats at the Consulate General of Ireland, Atlanta, 1916 Centenary Concert. Consul General of Ireland in Atlanta Shane Stephens speaks at the Atlanta Centenary Concert. MARCH 16, 2016: Sgt. William Jasper Military Ceremony At this annual St. Patrick’s Day ceremony, Minister Paul Kehoe TD, Government Chief Whip and Minister of State at the Departments of An Taoiseach and Defense, introduced keynote speaker, Lt. Damien O’Herlihy, a reservist from Irish Defense Forces who provided an excellent account of the history of the Defense Forces dating back to 1916. OCTOBER 22, 2016: Emmet Park Bench Dedication Ceremony Monsignor William Oliver O’Neill sprinkles holy water during the dedication ceremony for newly installed Irish limestone benches in Savannah’s Emmet Park. 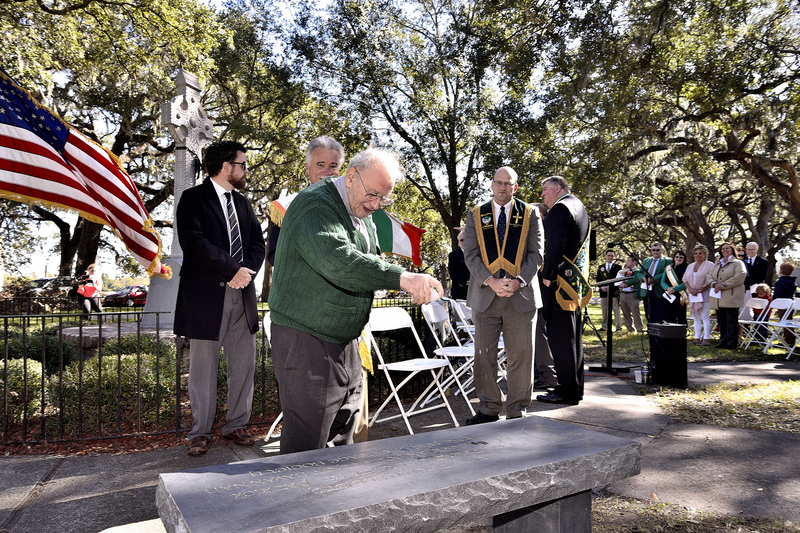 Numerous Irish organizations in Savannah and the Consulate General of Ireland supported this 1916 centenary project led by the Ancient Order of Hibernians. 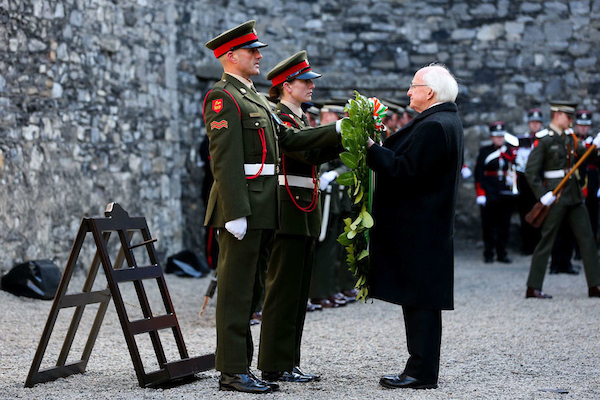 How the 100th anniversary of the Easter Rising was commemorated throughout the world. Briona Nic Dhiarmada delivers a lecture at Concordia University. What Ireland’s Ambassador to Canada Ray Bassett had in mind when he outlined 1916 Easter Rising commemorations in 2016 was sea-to-sea participation. The embassy launched a year of remembrance with Canada, the Irish Language, and the Easter Uprising 1916: A Commemoratory Conference at the residence of the ambassador of Ireland in Ottawa. One of the most ambitious programs over the year was by Concordia University’s School of Irish Studies – Reframing 1916: History and Legacies of the Easter Rising. 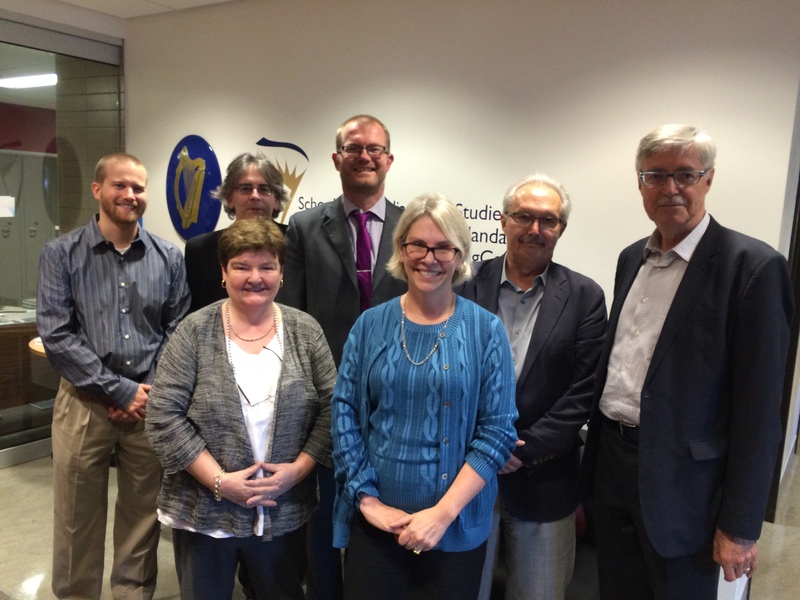 Back row (L-R): Mike Rast, Gavin Foster, Brian Hanley, Christopher Fox, Michael Kenneally (Principal, School of Irish Studies, Concordia University). Front row (L-R): Bríona Nic Dhiarmada, Pamela McGovern (Chair, Canadian Irish Studies Foundation). The September 21 event in Montreal, in collaboration with the University of Notre Dame’s Keough-Naughton Institute, offered an in-depth look at one of the key turning points in Irish history. 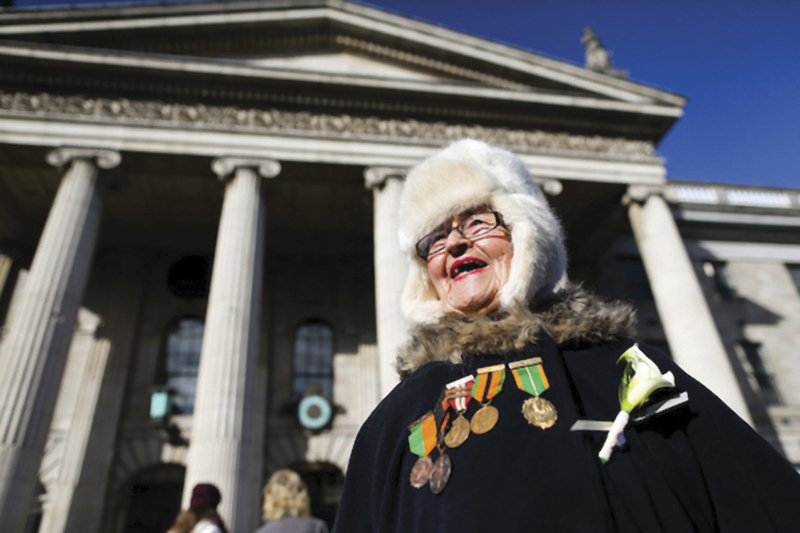 It included a day of public events to mark the 100th anniversary of Ireland’s famed 1916 Easter Rising. The day’s events included a morning symposium featuring Irish historian and author Brian Hanley, plus speakers and panelists representing Irish Studies from both Concordia and Notre Dame. 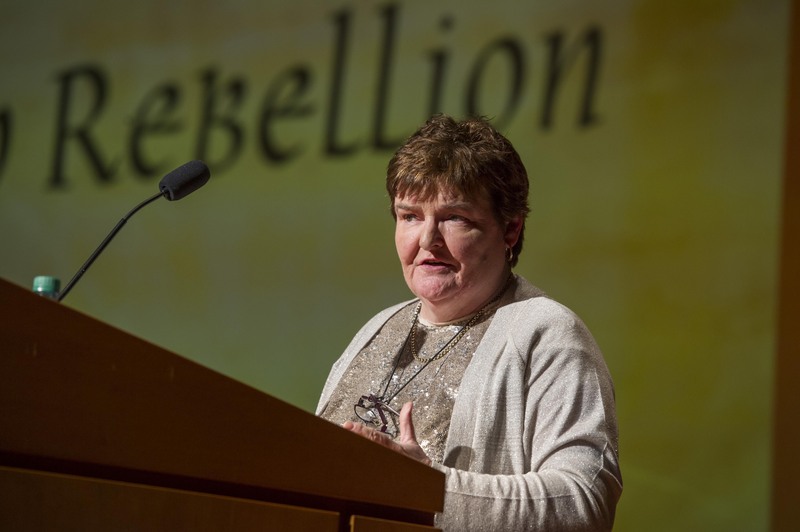 The main event was a free public showing of the landmark documentary, 1916: The Irish Rebellion, followed by a panel discussion with the film’s writer and producer, Notre Dame professor Bríona Nic Dhiarmada. “We aimed to present this pivotal historical event to a broad audience in an accessible manner that is both serious and informative, but also highly visual and evocative,” said Nic Dhiarmada. “It’s fitting that Concordia and Notre Dame, the premier centers of Irish Studies in Canada and in the U.S. respectively, are working together to remember and reconsider the Easter Rising,” Foster observed. The scene at from the School of Irish Studies at Concordia University in Montreal of the “Reframing 1916: History and Legacies of the Easter Rising” symposium and documentary screening of 1916: The Irish Rebellion. March 26 — Irish Canadian Club, Hamilton presents Out of the Foggy Dew: Rebel Voices of 1916. March 31 — Sile de Valera, granddaughter of Eamon de Valera, will give the Eleventh Annual St. Patrick’s Society Lecture in Irish Studies at Concordia. April 3 — An Cumann, the Irish Association of Nova Scotia, Saint Mary’s University Irish Studies Program, and Dalhousie University Centre for European Studies present Ireland’s 1916 Easter Rising. 1916 silent footage with musical accompaniment. April 7 — Irish Women’s Network BC and Simon Fraser University: Talk by Dr. Mary McAuliffe, University College Dublin, on Realists and Idealists: Women of the Easter Rising, 1916. April 23 — Irish Canadian Cultural Association of New Brunswick, Moncton Chapter: 1916 Commemoration featuring a talk by Dr. Stewart Donovan of St. Thomas University. April 26 — An illustrated public talk: Prof. Greg Marquis, Department of History and Politics, University of New Brunswick, Saint John, “The 1916 Irish Easter Rising and New Brunswick,” hosted by the New Brunswick Historical Society. May 1 — Commemoration of 1916 hosted by Celtic Folk Night Group – music, songs, poems, readings of the period – in Heart and Crown snug, Ottawa. May 21 — Friends of Sinn Féin (Canada) Inc. presents 1916 Rising Centenary Concert with The Wolfe Tones, The Estonian House, Toronto. May 27 — 1916 Commemoration Concert, Musicians of the World Symphony Orchestra, Montreal. Supported with a grant from the Embassy of Ireland. 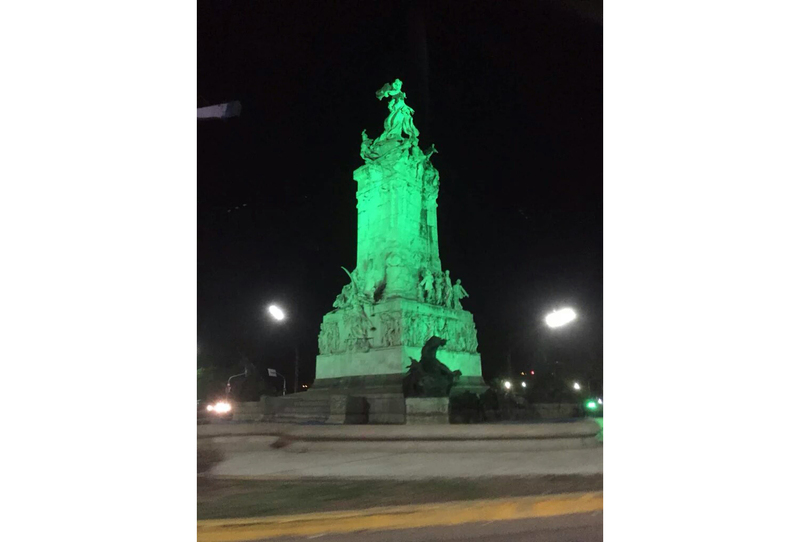 The Spanish Monument in Buenos Aires, raised in 1910 for the centennial of Argentina’s Revolution of May, illuminated green for Ireland’s own centenary. Irish migration to Argentina in the 19th century led to the creation in the early years of the 20th century of a strong Irish-Argentine community, with its own institutions and newspaper The Southern Cross. The Easter Rising of 1916 evoked significant interest among the Irish community both in Buenos Aires and in other parts of the country where the Irish had settled. William Bulfin, the editor and proprietor from the mid-1890s of The Southern Cross kept his readers well informed about major cultural and political developments in Ireland. His son, Eamon, who was born in Buenos Aires in 1892, played a significant role in the Rising, hoisting the flag of the Republic on the roof of the GPO. Eamon Bulfin was later condemned to death, a sentence that was commuted owing to his birth in Argentina. Following the election of the first Dáil in December 1918, it was decided in Dublin to establish a diplomatic mission in Buenos Aires and Bulfin was sent as the first Envoy. For the Irish-Argentine community in Buenos Aires and the surrounding pampas, March and April of 2016 were filled with events celebrating Ireland’s ties to Argentina, with the main event titled, simply, “Buenos Aires Celebra Ireland,” Buenos Aires Celebrates Ireland. 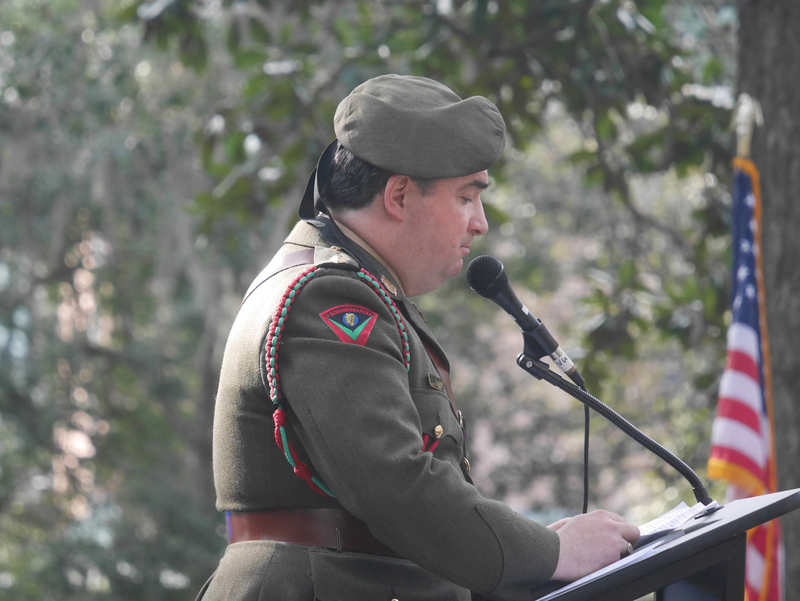 Among the notable events, the Argentinean Navy Band marched in the St. Patrick’s Day Parade for the first time (The Argentine Navy was founded by Mayo-born William Brown), and the Hurling Club of Buenos Aires put on a day of activities and an evening concert. 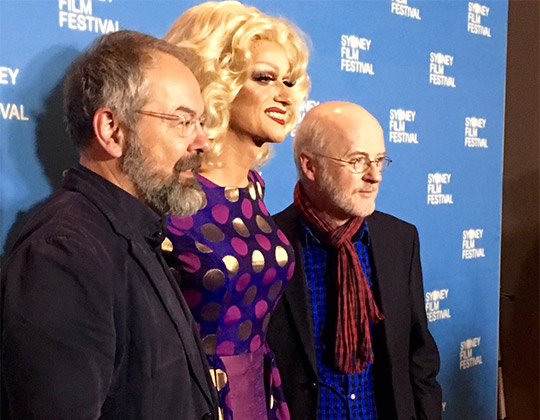 SYDNEY: Director Conor Horgan and Panti Bliss, “The Queen of Ireland,” pictured alongside Ambassador Noel White at the Sydney Film Festival Hub. On June 16, the Consul General hosted a reception at the Sydney Film Festival to mark the “Focus on Ireland – From Rebels to New Romantics” short film season at the Festival. The season was supported by Culture Ireland and Tourism Ireland and curated by Gráinne Humphreys, director of the Dublin International Film Festival. The season included Sing Street, The Queen of Ireland, Viva, Atlantic, and Michael Collins. One other notable in Australia was “Women, Dreamers, and Ireland’s Rising,” organized by the Irish Consulate in Sydney and the Irish National Association of Australasia. 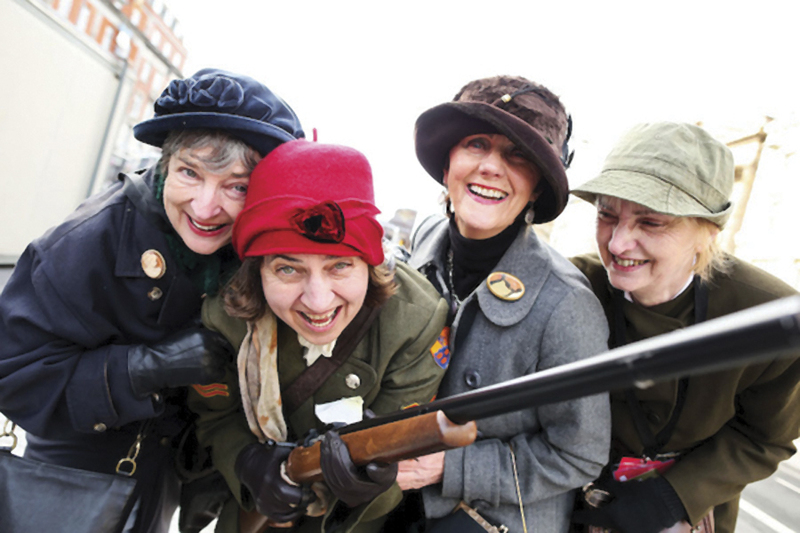 The event celebrated the poets, playwrights, musicians and dreamers – many of them women – who paved the way for an Irish Republic by inspiring, taking part in or responding to the 1916 armed insurrection against British rule in Ireland. 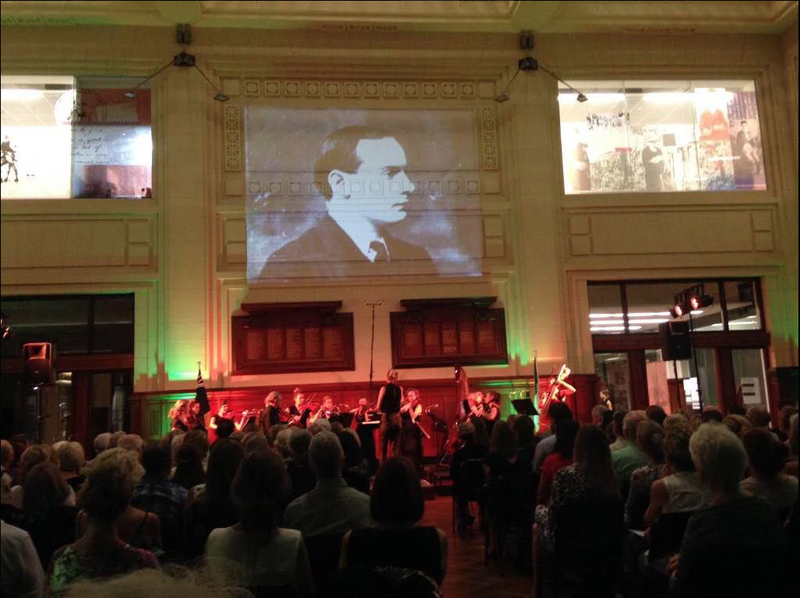 Elsewhere on the continent, cities commemorated the Rising throughout the year with concerts, lectures, and dedications to the history of the Irish in Australia. MELBOURNE: Breandán Ó Caollaí, Irish Ambassador to Australia, and his wife Carmel, visited the Celtic Club in Melbourne in October at an event commemorating the Easter Rising. The Celtic Club is the oldest Irish club in Australia. PERTH: On Easter Week, 2016, the Perth Chamber Orchestra, led by Paul Wright, commemorated the Centenary of the Easter Rising with a Centenary concert at the GPO Building in Perth. The concert combined traditional Irish music with classical numbers to tell the story of the Rising. 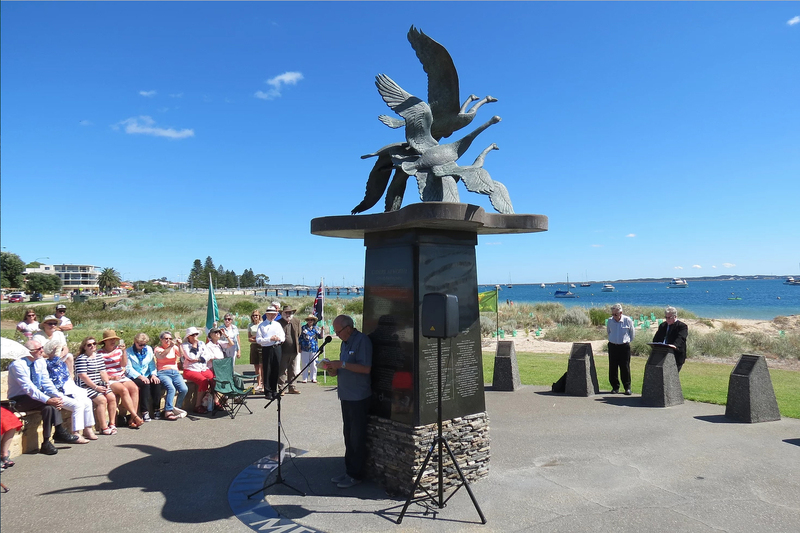 ROCKINGHAM BEACH: In March, Australian Irish Heritage Association commemorated the Catalpa rescue in a ceremony at Rockingham Beach’s Catalpa Memorial, outside of Perth. The Catalpa was a ship bought by Clan na Gael and John Devoy in New York that helped six Irish Fenian prisoners escape from imprisonment in Western Australia in 1876. 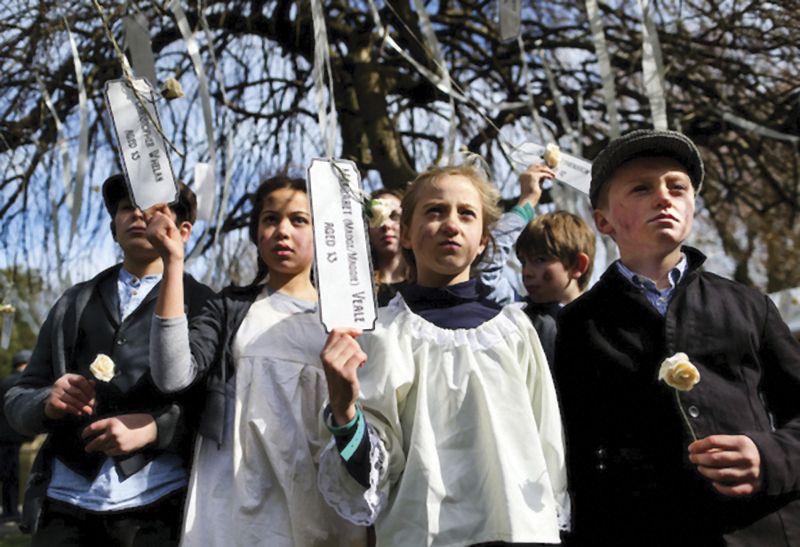 Several cities across New Zealand held Easter Rising centenary events, including Wellington, Auckland, and Dunedin, where an academic conference, “‘Yet No Clear Fact To Be Discerned’: New Zealand’s Response to the Rising,” saw scholars from the University of Otago, New Zealand’s Centre of Irish and Scottish Studies, and the Toitu Settlers Museum come to share the untold story of New Zealand’s involvement in the Rising. In Wellington, New Zealand’s capital, the Wellington Irish Society, which traces its history back to 1939, hosted a special exhibition on the Rising. And in New Zealand’s largest city, Auckland, the month of April was dedicated to the centenary. The Auckland Irish Society hosted lectures, musical evenings, a “Great Debate on the Easter Rising,” at the Auckland Irish Club, and a capstone event on April 24, the day of the Rising, during which copies of the Proclamation were given out to all attendees (pictured above). 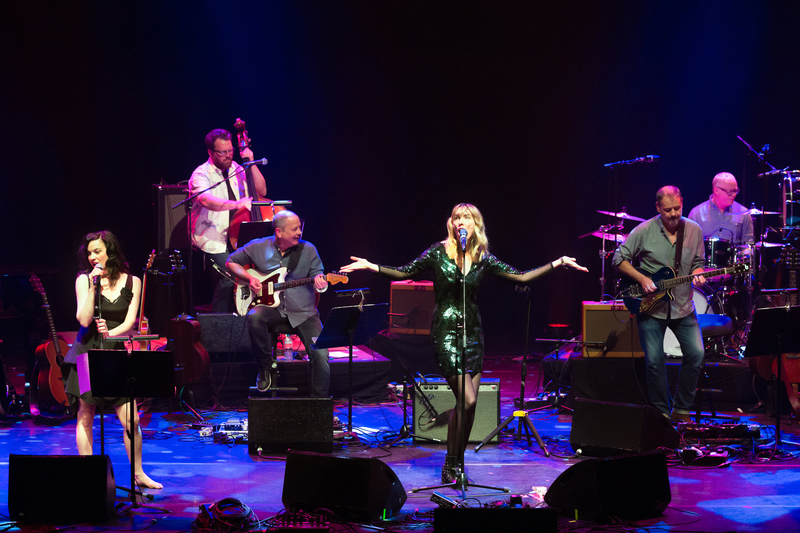 London’s “Imaging Ireland” concert took place April 29 at the Royal Festival Hall. Produced by the National Concert Hall in Dublin in association with Serious Music in London, the concert was London’s response to the “Imagining Home” concert series at the Dublin’s National Concert Hall, a musical conversation between Ireland and England through the music of the past 100 years. Among those in attendance at the sold out show were Irish President Michael D. Higgins and his wife, Sabina. 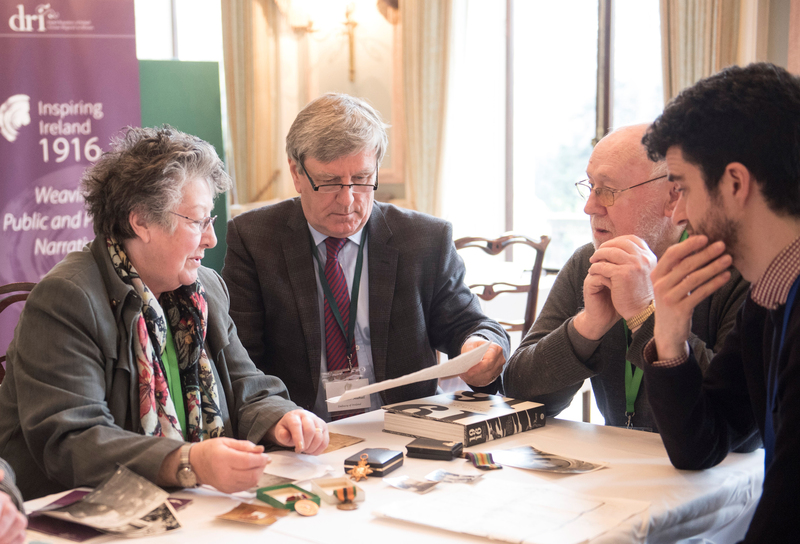 The Embassy of Ireland in London hosted an “Inspiring Ireland” 1916 Collection Day which was attended by over 200 people. In total, 17 contributors came from across the U.K., and the event collected and digitized over 40 unique objects for sharing in upcoming exhibitions, including medals, political pamphlets, photos and even a Celtic kilt pin worn by a member of a pipe band. 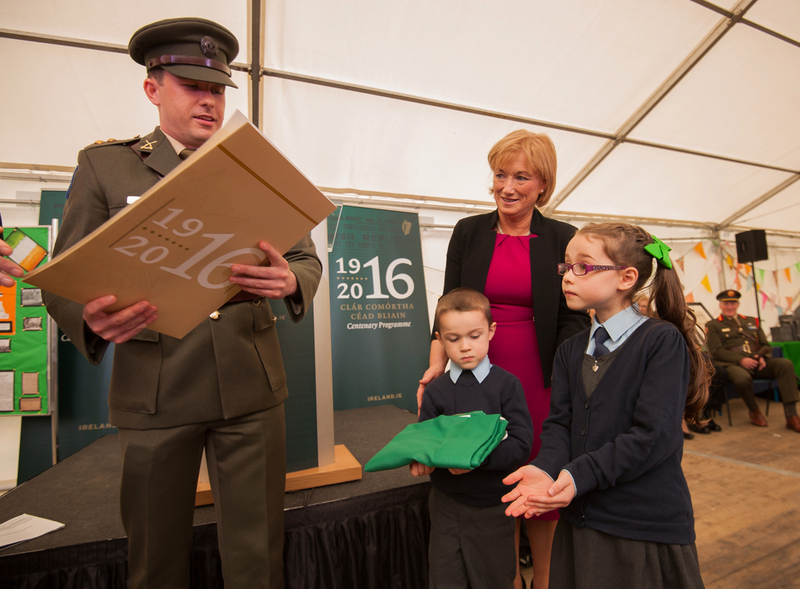 Lt. Shannon presents a copy of the Irish declaration of independence and an Irish flag to Conor and Kyla McDonagh in Cornanool National School in Co. Mayo on Monday morning as part of the 2016 Flags For Schools program. Also pictured is school principal Ann O’Hara. The main Easter commemorations were in Dublin where most of the action happened on Easter Monday, April 24, 1916, but the Rising left deep scars on those beyond the Pale of Dublin. There were hundreds of commemorations in small towns, and villages, across Ireland, in Donegal, Longford, and Tipperary, and cities such as Cork and Belfast. 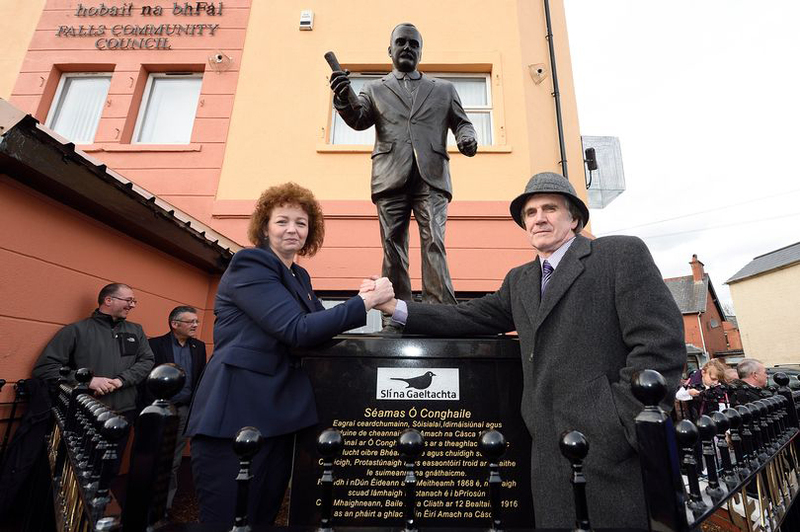 Culture Minister Caral Ni Chuilan pictured with James Connolly Heron, the Great Grandson of James Connolly at the unveiling of a statue to him in west Belfast. Unveiling the statue of John Devoy in Kildare. Pictured are Mayor of Kildare, Cllr. Brendan Weld (left) and U.S. Ambassador, Kevin O’Malley (right). October 25, 2015. Maynooth 15 re-enactment walk from Maynooth to The Garden of Remembrance, 23 April 2016, commemorating the walk by 15 Volunteers in 1916 from Maynooth to the GPO. The annual Tír Chonaill Stone Festival includes dry stone wall workshops and stone, carving workshops, as well as talks and tours of local stone heritage. This being the centenary year, the festival committee, with support from the Donegal County Council Community Commemorative Grant Scheme and other funders, unveiled a special collaborative sculpture entitled Clocha na hÉireann, which was in the making for twelve months. The collaborative work, a wall map of Ireland, incorporates stone from the 32 counties and the work of stone masons all over Ireland (above). The sculpture is clearly visible, being located in a parking area & viewpoint, and many visitors are specifically making Glencolmcille a destination in order to see it. It will stand the test of time and is a fitting contribution to the legacy of the 1916 commemorations. The unveiling ceremony, which was held on June 18, 2016 in Glencolmcille, County Donegal, drew a crowd of 800 people despite damp conditions. The talk on local volunteer Donnchada MacNiallghuis was at full capacity, recorded for future release. “As down the glen one Easter morn” – Michael Leane, Conor Leane and neighbor Lori O’Connor of Coolroe, MacGillycuddy’s Reeks. The Leane brothers have connections to the 1916 Rising on both maternal and paternal sides of the family. Their great-great-grandparents were Pat and Mary Plunkett from 16 Moore Street in Dublin City. It was in their house, the final headquarters of the 1916 Easter Rising, that the surrender note was written on the back of the Plunkett’s wedding photograph. Their bed linen was used to wrap a wounded James Connolly before his execution and later handed back to the family by Cumann na mBan. On the other side, their great-great-grandparents and uncles Davy “Garret” Leane, Michael “Mackey” Leane, a bomb engineer based in Waterford, and Patrick “Higgins” Leane, who was first Magistrate in Beaufort, fought bravely in the War of Independence, receiving medals for their actions, which included hiding out for five days in “Die Hards Den” in the Hags Glen. 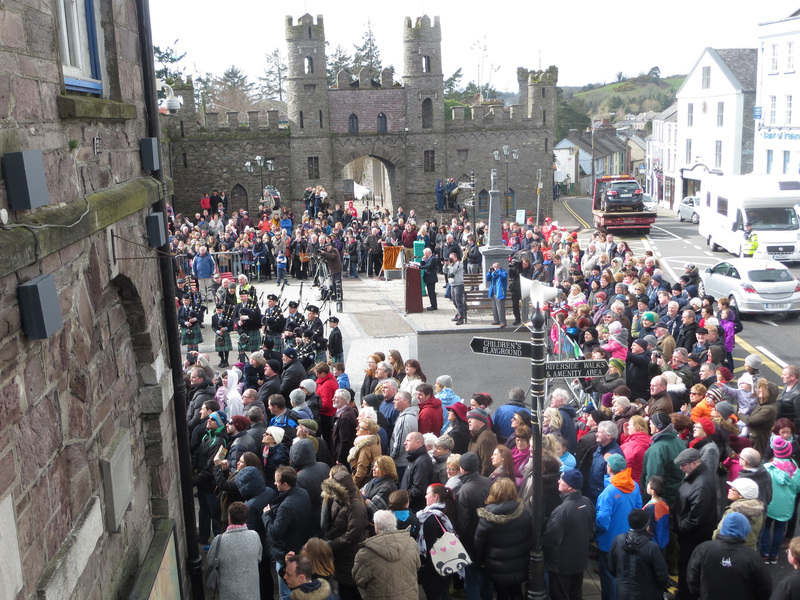 MACROOM: Over 1,000 people paraded together in Macroom, County Cork, to commemorate the centenary of Easter Sunday 1916. Pictured at the St. Patrick’s Day Parade 2016 in Ballymahon, County Longford. Kiernan’s car with Eamon Creamer. This car once belonged to Larry Kiernan, brother of Kitty Kiernan – the fiancée of Michael Collins, and would have transported Collins around the Granard area on his visits to meet Kitty. Reading of Proclamation at unveiling of plaque by Durlas Eile Eliogarty Committee at St. Mary’s Garden. Muriel MaCauley, grand-daughter of Thomas MacDonagh, with her daughter Michelle Drysdale and grandson Matthew Drysdale at the unveiling of the Thomas MacDonagh statue in Cloughjordan in May. 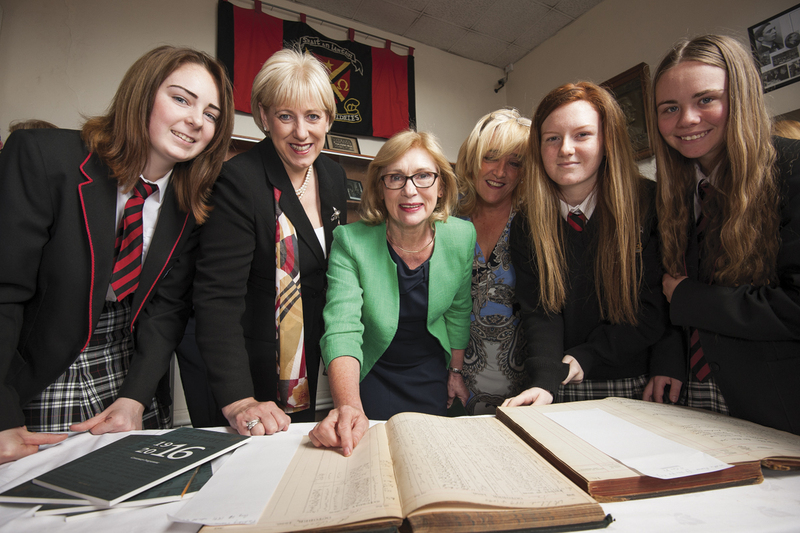 Sinead McCoole talks to students from the Gaelscoil in Nenagh about the Mna1916: Women 1916 exhibition in the Nenagh Civic Offices in December. Parade to St. Marys Memorial Garden, Thurles. Jed Walsh and Una de Paor standing with their portraits taken for the “1916 Descendents” project by Damian Drohan. Reenactors John Goff and Ray Murphy at Enniscorthy, Co. Wexford where the Athenaeum was officially re-opened. The Athenaeum played a highly prominent role during the 1916 Easter Rising in County Wexford, when it was occupied the Irish Volunteers in support of the Dublin Rising. Irish Defense Forces passing by Enniscorthy Castle, in the shadow of Vinegar Hill, the location of the decisive battle of the Rebellion of 1798. Marie and Jim Wilkinson, from the Enniscorthy Reenactment Society, during last year’s commemorations in Enniscorthy on Easter Monday, March 28, 2016. Rosie and Emily Murphy from Enniscorthy. Raising of the Patriot’s flag in Enniscorthy, April 27, 2016. Enniscorthy reenactors are inspected by John Grey during the commemorative events. The reading of the Proclamation in Enniscorthy, Easter Monday, 2016. As you will see when you turn the pages, we couldn’t stop with the photographs in this commemorative issue. From North America to Argentina, Australia to Ireland, and places in between, we bring you pictures of school children and senior citizens, native Irish and the descendants of Irish immigrants in far off lands, paying tribute to the men and women who fought so bravely in Ireland’s bid for freedom in 1916. 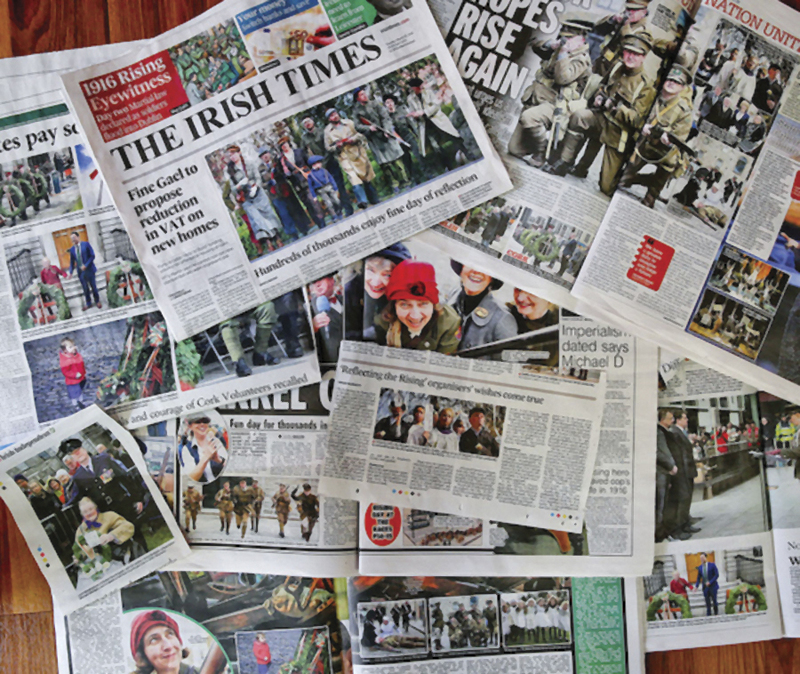 From the big parade in Dublin, which drew a crowd of over 250,000, to smaller events in rural Ireland, to New York and Boston, to Buenos Aires and Auckland, the spirit of the centenary was captured in photographs that, while great to look at now, in years to come, will serve as an important visual dimension to our history. Since its invention, photography has provided a window into the past, and alongside all the documentation of modern history in the making in this issue, we also bring you some rare photographs from the Sean Sexton collection that cover the period after the Rising, when the Irish were battling it out with British forces during the War of Independence. Irish history doesn’t just linger in the eye, it burns in the heart. The stories my father told me of the Black and Tans (British Army irregulars known for their brutality) gave me nightmares as child, and some vestige of that anxiety resurrected itself as I looked through Sexton’s images while making my selections for this issue. I turn away from the war photos only to become fixated on images of evictions dating to the 1880s, when struggling Irish tenant farmers, still recovering from the famine and unable to pay their rent, had their houses leveled and their few remaining possessions sold off. These are the toughest images for me to view. Harrowing, in fact. I have an unreasonable fear of being homeless that is not rooted in reality. I think it’s inherited – part of my DNA. There were more evictions in my home country of Tipperary in 1847 than in any other county in Ireland. Well, not entirely. As we mark the centenary of the Easter Rising, we are careful to use the word “commemorate,” not “celebrate.” The country that was whole during all the years of British occupation is now split in two. Not that I blame those who signed the Treaty. The rebels couldn’t hold out against the might of the British forces forever. It was partition or it was or nothing. The hope of Michael Collins, that a free 26-counties would be the first step in a process that would eventually lead to an independent Ireland free of British rule, was not to be. The signing of the Anglo-Irish Treaty led to a civil war so horrific that it was barely mentioned when I was growing up. I still can’t bear to read about it, let alone see photographs. And at the end of it, the North stayed partitioned and the 26-counties, war-weary and heart-sore, turned away and set about re-making themselves. 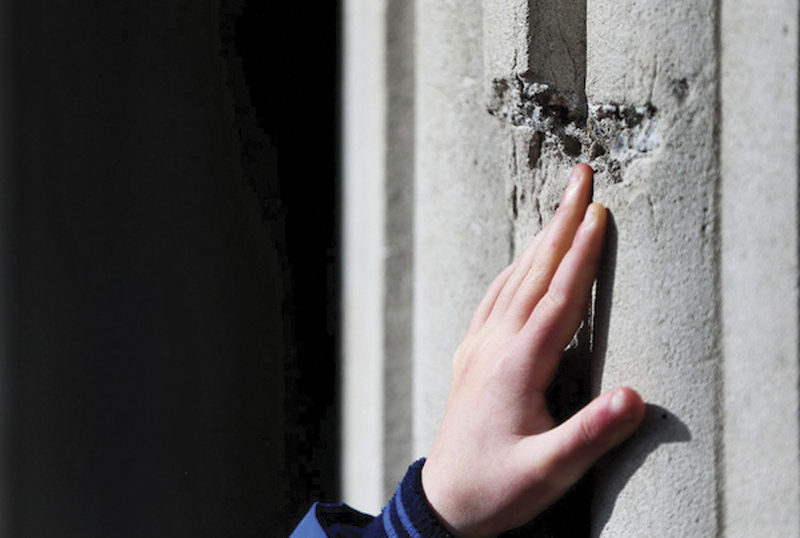 The Troubles that plagued Northern Ireland throughout most of its existence exploded into massive violence in the 1970s with terrible consequences for all, especially the children. We are reminded of this by Sarah Buscher, writing in this issue on the documentary How to Diffuse a Bomb, the story of Project Children. Here we find a hero that the leaders of 1916 would be proud to know. Denis Mulcahy, a bomb squad detective with the New York Police Department, founded Project Children in 1975, and over the next 40 years, with the assistance of many kind and generous American families, he changed the lives of thousands of children from Northern Ireland by giving them a respite from the violence and a chance to just be kids for a while. But here now, to offer some reassurance, let me introduce Anne Anderson, Ireland’s ambassador to the United States. Anderson believes we are more than capable of meeting the challenges to come. In a recent lecture (adapted for this issue), she said, “History has its coincidences: it has not escaped us that, just at the time we were commemorating the events of 1916 – the beginning of the end of British rule in Ireland – we found ourselves facing another radical adjustment in British-Irish relations: for the first time ever, one of us will be inside the European Union and the other outside. Arecord number of Irish passports were issued in 2016, the Irish Department of Foreign Affairs announced in January. In total, 733,060 passports were issued last year, a nine percent increase from 2015. Brexit, he said, was also a factor. “Following the U.K. referendum on E.U. membership in June, passport applications from Northern Ireland saw an increase of 26.5 percent over 2015 to 67,972 while application levels from Great Britain increased by 40.6 percent to 64,996. The Irish Consulate in New York had the highest demand for passports, issuing 7,205 in 2016. This was closely followed by Canberra, San Francisco and Sydney. In January, too, Minister Flanagan announced a number of major passport initiatives meant to modernize the passport service, including an enhanced on-line application tracking service, which allows passport applicants to accurately track progress of their application in a visually dynamic way with a progress bar animation as well as a web-chat social media service to facilitate “real time” communication between the Passport Service and passport applicants. Former Deputy First Minister of Northern Ireland Martin McGuinness announced in January that he would not be running for re-election due to an earlier diagnosis with a rare medical condition. 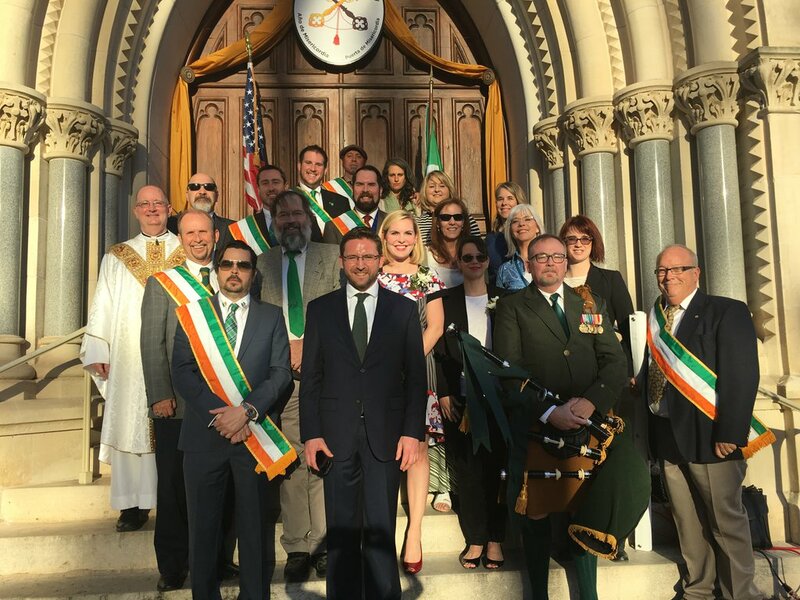 Taking on the role as lead representative of Sinn Féin in Northern Ireland is Michelle O’Neill, the outgoing Northern Irish minister for health and niece of prominent Northern Aid official Paul Doris, who acted as Grand Marshal of the 2016 St. Patrick’s Day parade in Philadelphia. “I have to be honest with myself,” McGuinness said at a press conference. “This has taken a toll on me in the course of recent times, and the reality is that I’m not physically able to put the energy and the effort that is needed into this election. McGuinness’s resignation process began with a dispute with Northern First Minister Arlene Foster. Foster had refused to stand aside in face of an inquiry concerning a massive cost overrun on a project to replace fossil fuel usage with wood burning fuels, resulting in a potential $450 million fallout to be paid by the Northern Irish taxpayer. Weeks later, McGuinness declared that due to being diagnosed with an uncommon genetic disease known as amyloidosis, which causes the abnormal buildup of protein in the body’s organs, he would be putting aside an attempt to run for re-election in order to concentrate on his health. “As a united all-Ireland team, we will give [O’Neill] the space and support to find her own voice and continue the good work Martin pioneered,” said Sinn Féin president Gerry Adams when announcing her appointment. He also asserted that she would guide the party into the next generation. O’Neill’s new position of First Minister or Deputy First Minister of Northern Ireland will be decided by the general public when Northern Ireland goes to polls on March 2, heavily dependent on how Sinn Féin fares in the vote. The Tyrone native first became involved with the party in 1998 as a trained welfare advisor, working directly with Martin McGuinness after the Good Friday Agreement was signed. She has represented mid-Ulster in the Northern Ireland Assembly since 2007, and is the first leader of Sinn Féin in Northern Ireland to be devoid of direct Irish Republican Army involvement, though her father (Sinn Féin councillor Brendan “Basil” Doris) was a formerly taken prisoner by the group. In January, Sligo was announced as the European Volunteering Capital for 2017, beating out other European cities like Belfast, London, Edinburgh, Bruges, and Cagliari. A joint application was submitted from Sligo County Council and Sligo Volunteer Centre, according to volunteersligo.ie. The jury commended Sligo on having “well thought out and properly resourced volunteering strategies” which can have “a transformative effect on local communities.” They also referred to the fact that Sligo Volunteer Centre celebrates its 10 year anniversary this year. The competition aims to promote volunteering at the local level by giving recognition to municipalities that support and strengthen partnerships with volunteer centers and volunteer-involving organizations, celebrate and promote volunteering and the impact made by volunteers. The 10 year anniversary of the Cliffs of Moher Visitor Experience was celebrated with a tourism networking afternoon at the Experience’s headquarters in Liscannor, Co. Clare in February. The event also marked 2016 as a record-breaking year for the Experience, with 1,427,166 people visiting the center to take in the beauty of one of Ireland’s most prominent natural wonders. This figure represents a 14 percent increase in visitors from the previous year. Owned by the Clare County Council, the Cliffs of Moher Visitor Experience has undergone substantial investment in product and facilities in recent years, while the launch of the 7.5-mile Cliffs of Moher Coastal Walk and the visitor attractions’ status as a “Signature Point” along the 1,553-mile Wild Atlantic Way has contributed to its growing popularity.